I am surprised that there is not much discussion on this accessory. I just bought it to test out, and I'll write a review once I try it out. It seems like it will be awesome...or crap. I'll let you know! Any users of this unit care to chime in? Yep, I've got one and like it. Great for bright light and the top flips out so you can still use the touch screen on the LCD. I love the look of it and use it all the time. The articulation of the loupe up and down makes it really handy and it works much better than the plain magnetic one. However, it's a bit awkward to attach and takes up a lot of room in a camera bag if you want to leave it on the camera. Be careful when you push the LCD in and out as there is a bit of black foam liner on the leading edge of the loupe. When I pushed it in a few times the foam liner came away. I just received the unit in the mail today, and overall...I am very impressed. It seems to be well built, and the mechanics of the loupe hinges work well. It definitely feels like a lot of thought went in to the design. The magnets seems to hold the loupe closed securely, so I don't think it will swing open on it's own. And it's nice that the hinges lock in the open position, so when you are using the hood without the loupe, it stays open on it's own. I am happy with the metal mounting bracket. It attaches to the camera securely and has 2 little metal extensions which hug the camera body tight enough to prevent unwanted swing of the bracket. I feel safe leaving the unit mounted to the camera, since the metal bracket should prevent unwanted movement of the LCD. I had no idea how useful the magnifying loupe would be! 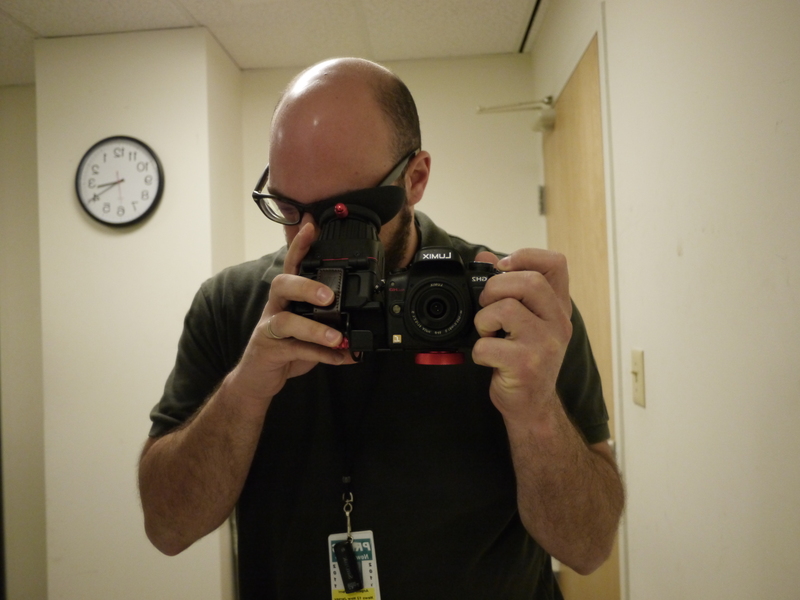 It really helps you see focus a lot better - and the diopter is nice since I wear glasses. So I can set focus that is most compatible with my glasses. While it does make the camera a lot bigger (it's about as big as the camera), if you have the right case it's not an issue. - Pressing your eye to the loupe adds a 3rd point of stability. And since the loupe is attached to the camera body with a metal bracket, it becomes a very rigid system that is easy to hold and very smooth for handheld shooting. Although...in the process of uploading this photo, I see that the HDMI & USB ports are completely blocked. So if you plan on leaving the loupe attached to the camera full-time - it will be easier to pull off your footage with a card reader instead of the on-camera USB. And HDMI is basically unusable while the loupe is attached due to the location of the port. Yes the HDMI out is blocked by the loupe. Since I don't monitor at the same time I attach a loupe thats fine for me. Great for long lens shooting as well. I use a battery grip on my GH2...Im wondering if the Loupe will attach with the battery grip in place. Guess the battery grip would have to go "under" the Loupe and may slip around. Anyone using battery grip with the loupe please post. This ia great loupe. I currently use a much cheaper one and doesn't perfectly fit the GH1. It is a bit too large and I have to gaff the stupid thing to keep it in place. A bit of a pain but it is worth the trouble for what it gains me. I might consider ditching it however and buying this one since it is designed for the GH cameras. It is 3x more expensive but I think it will be worth it. The one thing I like about the one I have however is that I can also use it will the LCD against the body but flipped out. These makes the camera look great and allows me to fit it in my bag without having to detach it all the time. Just received one this week and I used it on my GH2 on an interview assignment. This is a great accessory for the camera and everyone should look into getting one. The HDMI is not blocked if you have a right angle connector and I can see how the loupe can be used to fasten the HDMI cable from moving. Interesting point about the HDMI. I assumed there was no way to make it fit. I have to buy an HDMI cable, so I'll look in to the right angle models. After watching the video.....I guess I could use the battery grip screw, to attach the loupe bracket to the GH2. Gotta have my battery grip...grown to love it. Just ordered one. I guess I better get used to using my left eye. I didn't even think about that. That may take some getting used to. hummm. It's certainly going to be interesting Jeff. I have a Hoodman on the 7D and an EVF on the XA10 and a prism on one of my Still cameras. I have an identity crisis. I bought the GH2 to "run and gun"...with all the stuff Ive got on it now it's "walk and gun" :>) I will soon need someone to help me lift it up to the tripod.